The latest print edition of the North Phoenix neighborhood magazine “In&Out” features the AZ-08 Congressional race between Hillary Clinton donor Hiral Tipirneni and State Senator Debbie Lesko. Instead of the usual nonsense we see in the inept, Leftist AZ media, In&Out just asked each candidate a series of policy questions on issues ranging from school safety, illegal immigration, and school vouchers among a few others and simply printed their answers. It’s one of the best, most succinct articles we’ve come across in the past few weeks. Simple Q & A without any interpretation by the neighborhood magazine. Just the candidate’s own words for the readers to consider. A stunning admission that has been pointed out by several of our twitter followers is Hiral’s response to the Healthcare question. It may be the most enlightening of all the answers and may be the final nail in Hiral for Congress’s coffin. Hiral Tipirneni’s answer to the rising Healthcare costs. Those in the ObamaCare battle in 2009 may remember that the “medicare buy in” idea is another way of saying ”PUBLIC OPTION”, which is code-word for “Socialist Healthcare — tomorrow”. Hiral’s camp will state this is a tin-foil hat conspiracy theory to state that the “Public Option” means “Socialism”, but unfortunately for them, that response will not hold water. Why? 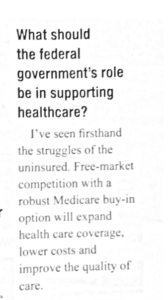 Because Rep. Jan Schakowsky (D-IL) let the cat out of the bag admitting that the intent of the “Public Option” was to destroy Private companies thus allowing the government to usher in Socialist Healthcare in America. As Rep Schakowsky stated openly in the YouTube clip, the “Public Option” is merely a means to an end. It’s simply a tactic used to bankrupt and destroy the Healthcare Industry with the goal of replacing it with a Government run system. A private insurer cannot compete with a government body that will just print it’s way out of debt while a company will have to rely on a functioning business model to remain solvent. This policy stance now in print and in the hands of AZ-08 voters could not have come at a worse time for the Hillary Clinton donor (and former doctor). Polls show her still losing the race by a comfortable margin, her malpractice scandal has now hit the news, and today’s Quinnipiac Poll shows the Dem lead in the Generic ballot has gone from double-digits down a several weeks ago to just 3% today. The news gets worse for the hard left Democrat, the same Quinnipiac poll shows even DEMOCRATS give credit to President Trump, not Obama, for the improved economy. 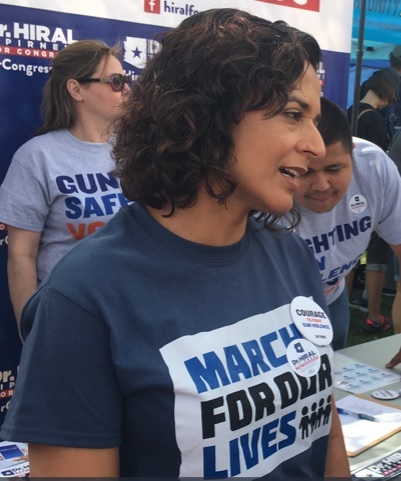 With Hiral now taking her Socialist mask off in addition to her scandals, all signs are pointing to the ‘Blue Wave’ drying out in the Arizona heat.